The Pneumatic Drive System [PDS] is used to control the force applied to the MDAC anvil by varying the pressure in its membrane. 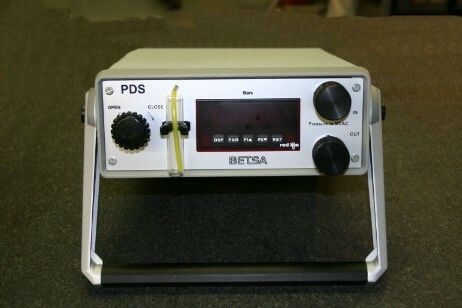 The small size, weight, and portability of the [PDS] allow its use in a variety of environments. 0 to 200 bars Pressure range. Digital Pressure display with a 0.01 bar resolution. 0.4 l Bottle filled with helium (200 bars) allows for many pressure cycles before reloading. High pressure connection for the output (on the rear panel): Nova Swiss female for 1/16’’ capillary. in Membrane DAC-based high-pressure setups. The Automatic Pneumatic Drive System is a modular pressure controller. The APDS controls the force applied to the MDAC anvils by varying the gas pressure applied on its membrane. The small size and weight, and the portability of the APDS allow its use in narrow spaces.